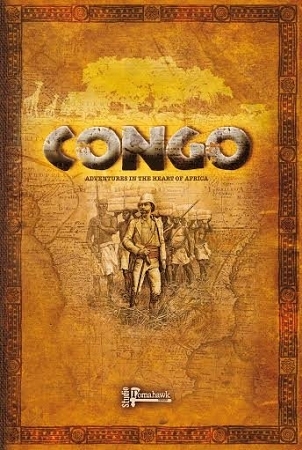 Congo takes the shape of a book (hardcover) 108 pages, full color. Inserted in the book you will find 8 Adventures and a dangerous terrain cardboard sheet. 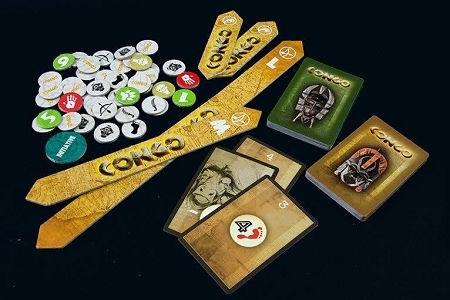 In addition to the book, your retailer will hand you a bag containing the deck of cards needed to play, and a punchboard with the tokens needed for the game and that also includes the measuring sticks. Not included in the game, you will need some dice (D6, D8 and D10) miniatures and some scenery to start your adventure!